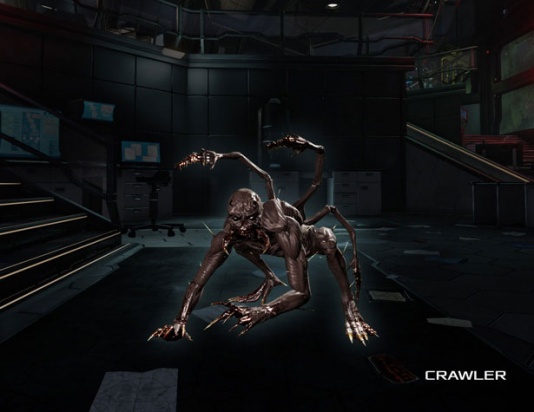 The Crawler is a common specimen in Killing Floor 2. It is classified as a lesser enemy, and therefore, cannon fodder. Crawlers appear as small, black humanoids with an insect-like gait, crawling on all fours. 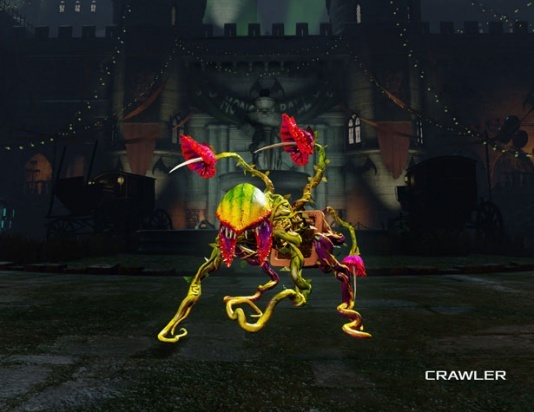 Crawlers are extremely fast and often sneak past defenses due to their small size. Crawlers move slowly when docile, and sprint when enraged. On higher difficulties, Crawlers have a chance to enrage upon sighting the players, and have a chance to enrage when shot. Once enraged, Crawlers will never stop sprinting until they are killed. Crawlers are slightly resistant to fire and bludgeoning weapons, significantly resistant to Microwave damage type and do not have any weaknesses to non-ballistic weapons. 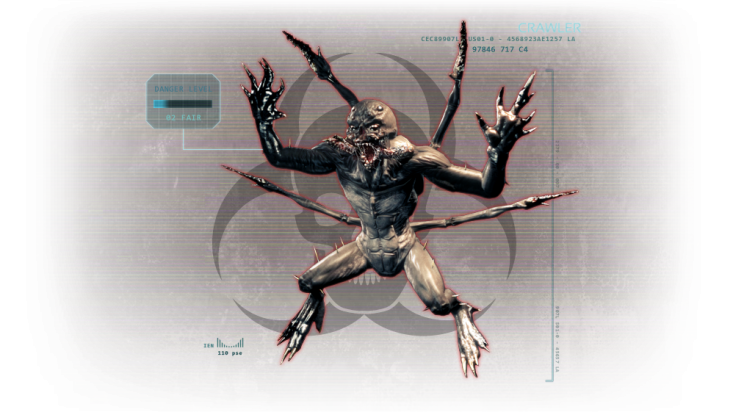 Crawlers have no resistances to ballistic weaponry and are extremely vulnerable to assault rifles and sub-machine guns. Crawlers only have one weak spot, which is the head. The Crawler is a glass cannon, ambush-based, melee-only ZED. Crawlers tend to spawn from unusual locations such as ventilation shafts, high ceilings or open manholes. This allows them to attack from multiple angles and slip past defenses undetected. Otherwise, they spawn and in huge groups of 4 to 8. Crawlers have the ability to dodge gunfire. When shot at, Crawlers will quickly leap to the left or the right, or lunge forward at the offending player if they are within range. On Suicidal and Hell On Earth, Crawlers will always dodge when shot at. 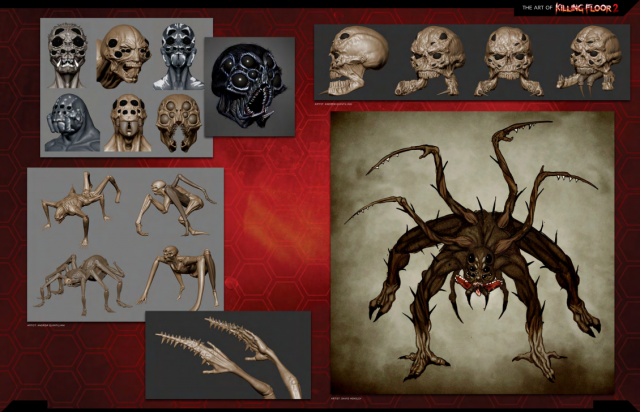 On Suicidal and Hell On Earth, Crawlers gain a huge boost in movement speed, as well as new attack animations that they will use when enraged. They easily become the fastest ZEDs in the game, only beaten by the bosses themselves in speed. 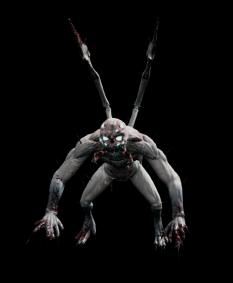 On Suicidal and Hell On Earth, Crawlers will begin to stand on their hind legs to scratch with their front legs, or throw themselves at players with a spinning clothesline attack. Both attacks deal multiple, high damaging hits. 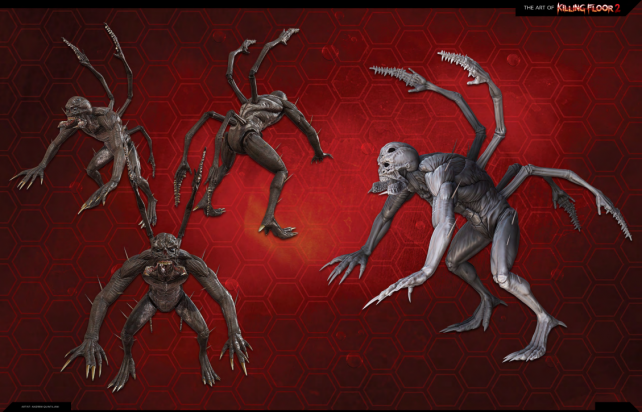 Crawlers have a chance of spawning as an Elite Crawlers aka Albino Crawlers (refered as King Crawlers in the code). These special Crawlers can be easily identified as they appear white instead of black. Albino Crawlers have the same HP values and resistances as normal Crawlers, but they have the ability to explode into a toxic gas cloud on death. The gas cloud obscures vision and deals damage over time to players standing in it. It will also damage ZEDs, though the damage is negligible. However, the gas cloud damage can cause ZEDs with dodging abilities to move erratically as they jump around trying to get out of the gas cloud. Albino Crawlers do not explode when shot in the head, though it is extremely difficult to do so given their incredible speed. Damage from multiple gas clouds does not stack. (PvP) Rally boost: forces AI Crawlers to sprint, players do x1.2 more damage. Damage to doors (possible values) = 7 / 35. Crawler has a chance to evade upon taking damage. Crawler has a chance to evade certain damage sources. Crawlers are extremely fragile. just about any form of weaponry will take them out very quickly. Ammunition can be saved in early waves by switching to the knife and cutting their heads off, though this is significantly more difficult compared to Clots, given their small stature. They also output significantly more damage, making knifing them a lot riskier. Crawlers should be disposed of as soon as they are sighted, as they are extremely easy to kill. It is also not wise to let a group of Crawlers close the distance as they deal a lot more damage than other lesser ZEDs - this is especially true on Suicidal and Hell On Earth. 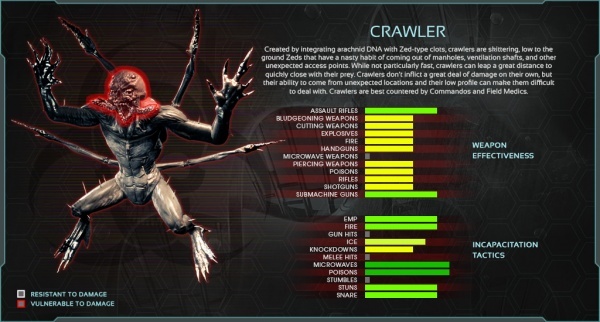 Extremely weak to Sub-machine guns and Assault Rifles, making the SWAT and the Commando the best perks for quickly exterminating huge groups of Crawlers at a distance. At close range, the Firebug excels at exterminating groups of Crawlers by setting the ground on fire, burning them quickly. This page was last edited on 1 March 2019, at 23:07.